Hurrah! We finally have livestock. 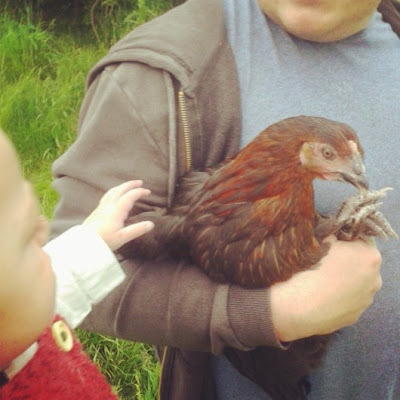 Today we introduced chickens to the pub garden. I'm very excited as I feel this is a huge step towards becoming self sufficient. 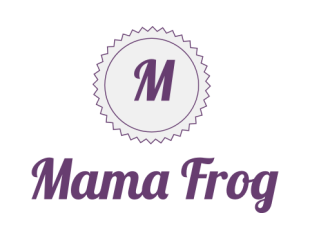 I've been thinking for a while about the connection between Attachment parenting and teaching your children respect for the planet and animals.Our lives are no longer cohesive with eating mass produced meat. But we don't feel like going vegan is for us either. After proving I could care for a kitchen garden -it was a natural progression to introduce chickens to our lives. We chose a well established local poultry farm Chalk Hill to get our flock. We bought four birds, on the presumption that each bird will lay 4/5 eggs a week (18 eggs) which will be more than enough for our family of three. Our birds are all hybrids and aged between 16- 20 weeks. 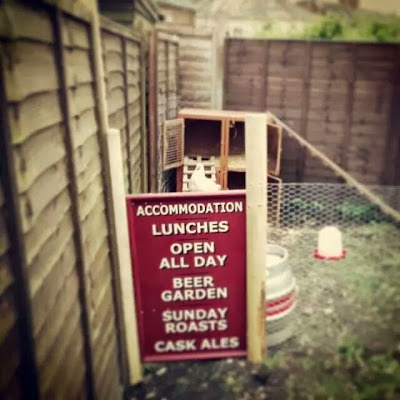 They seem to be very happy in our pub garden and we've created this simple enclosure for them to keep them safe from all the dogs that visit during opening hours. 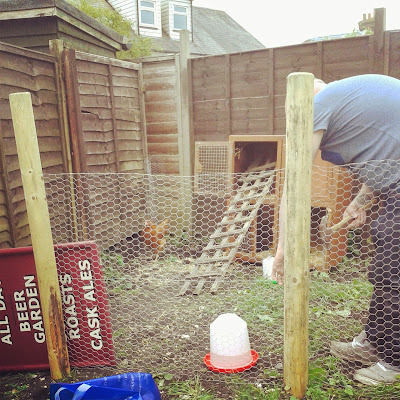 We used some old chicken wire and 4 basic posts to create the enclosure in the corner of our pub garden. We found this upcyled cupboard at a local tip. It makes a perfect hen house for four hens. I added some beat up old trellace that was hanging around from the storms earlier this year. My husband has lots of plans for building a custom hen house. But interim this homemade run complete with pub sign gate makes for a nice set up.